Arsenal’s Jack Wilshere is facing a club fine after being caught holding a shisha pipe in public, prompting a third smoking scandal involving the midfielder in two years, according to the Evening Standard. Wilshere was first pictured smoking in October 2013 outside a nightclub and insisted that it would be a one off. However, whilst on holiday in Las Vegas with Joe Hart last summer, further pictures emerged with Wilshere committing similar actions. Now, it is fair to say that Arsene Wenger has lost patience with recent reports suggesting that the Frenchman will demand answers. 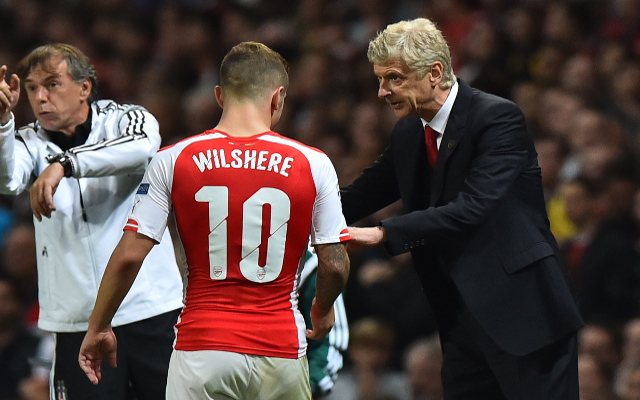 Wenger has previously taken a lenient approach when responding to Wilshere’s misdemeanour’s, mainly due to the mental toughness it has taken for the England midfielder to return from various injuries at a young age, but that seems to no longer be the case. According to the report, the club has taken a “dim” view to the incident and Wenger will wait for Wilshere’s explanation before deciding on the course of action. Currently sidelined with an ankle injury, the England international will return to full training next week where he will be competing with the likes of Aaron Ramsey, Santi Cazorla and Mesut Ozil for a central midfield position.